The first Public School No. 1 that served Rock Island’s first ward was a simple two-room frame building. Even before our school board was organized in 1857, it stood on the south side of Third Avenue between 7th and 8th Streets. Population growth soon resulted in the addition of a third room. As growth continued, the old schoolhouse was replaced in 1868 with a 2-1/2-story brick building, designed by W. L. Carroll, on the same site. Shortly after acquiring its new name, the 1868 school was deemed unsafe, so there was yet another new building. This third and last school at the site is shown on this circa 1905 postcard that Mr. and Mrs. Cal Whitmore shared. 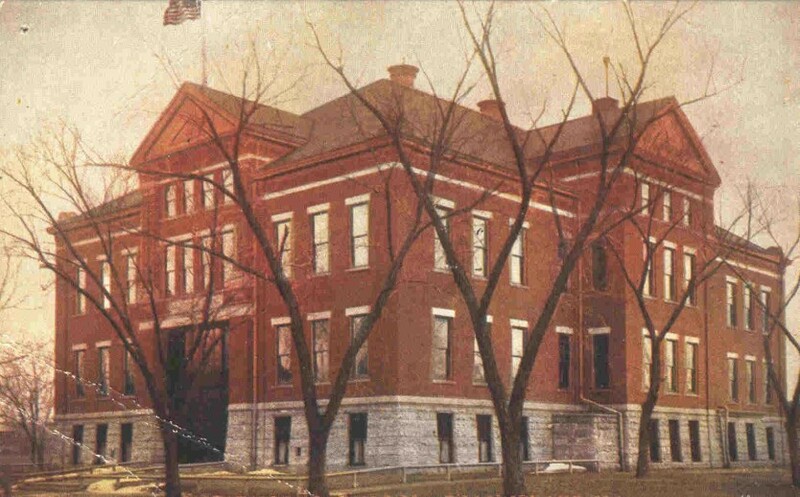 The postcard shows the northwest corner of school with the Third Avenue main entrance on the left. The three-story building was designed by architect F. S. Borgolte and the general contractor was John Volk & Co., with McConochie & Sons as the stone and brick contractors. Ferdinand Borgolte was born in Germany and studied at the Royal Building School and Building academies in Charlottenburg and Hanover. He had come to Rock Island in 1893 and opened an architectural office in the Mitchell & Lynde Building in 1896. Among his other designs were the 1902 High School, Harms Hotel, McNevin & Gansert Building, all in Rock Island, as well as Moline’s Carnegie library. The basement of Hawthorne held a manual training room, two primary classrooms — one called a “mission” kindergarten — along with a lunchroom and toilet rooms. There were thirteen other classrooms, six on the first floor and seven on the second. The corridors on the first and second floor corridors were 30 x 60 feet, while the classrooms measured 26 x 32 feet. The building was centrally heated and ventilated by a fan system – apparently successfully this time. Decorated with flags and potted plants, it opened on Monday, October 23, 1899, with speeches and music to celebrate the occasion. Reports of the opening also noted that the school was fitted with arc lights, which would have provided intense but harsh illumination. Like all schools of the era, it was fitted with many windows to allow excellent natural light on all but the darkest days. Only thirteen teachers and one principal were in charge of 544 students. That accounts for an incredible ratio of 42 students per teacher in tightly packed classrooms. Still, Hawthorne’s west end neighborhood was a stable one. Its 1912 enrollment was 535 and fifty years later when the school was closed, there were 376 students. Why did it close with so many pupils attending? Easy answer. The school’s land was in the path of a new highway. So it was necessary for Hawthorne students and their teachers to abandon their well-loved building. On December 18, 1961, everyone, students and teachers alike, formed a long procession and walked fourteen blocks over slippery, snow- and ice-covered sidewalks to a new school. And each carried bundles of books. Police were there to help cross busy streets. They arrived at their new school and joined 300 students from the former Irving School. This new school, which would be known as Hawthorne-Irving, had been built on 10th Avenue just east of 12th Street, behind the old Irving School. The new school had 24 classrooms, as well as a gymnasium. Its architect, Chris Maiwald, ceremoniously placed the American flag on the halyard, then stepped aside to let students raise it for the first time. Although the former Hawthorne pupils were reported pleased with their new building, many expressed regrets at leaving Hawthorne School and did not want to see it demolished. Nonetheless, Hawthorne was scheduled for razing “as soon as possible,” once salvageable material was removed. Its former site is just beyond the underpass where Fourth Avenue runs beneath the Rock Island Parkway. Old Irving was also scheduled for demolition in 1962 to create a playground for the new school. Both old schools are long gone, but the new Hawthorne-Irving building is still there, now called the Primary Academy. This article, by Diane Oestreich, is slightly modified from the original, which appeared in the Rock Island Argus and Moline Dispatch on July 27, 2003.